Welcome to the February edition of Scrap Attack Tuesday!! 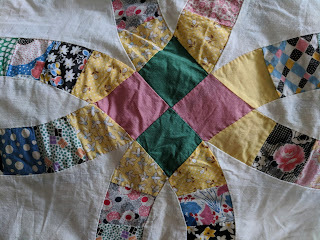 If YOU are a quilter, you probably have some fabric scraps. 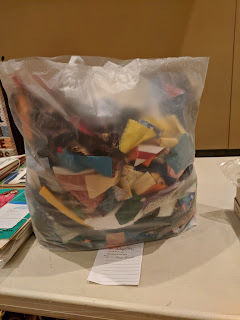 If you have been quilting for 20+ years like I have, you may have a TON of scraps!! (You may not want to admit to them, but you probably HAVE them.) Sarah to Confessions of a Fabric Addict not only HAS scraps, she's prepared to USE those scraps or give them away! Details of the Scrap Attack Challenge can be found in THIS POST. You can find Sarah's monthly task HERE. Thank you again, Sarah, for issuing a challenge to encourage us all to take another look at our scrap stash! I don't know about anyone else, but this is JUST what I needed to clear some more of my scraps from my studio shelves. Ah, scraps! I have a few I need to get cut and put into bins. Maybe later this month I'll have time for that. Hope you get your wedding ring quilt finished this month! Scraps? I know nothing of that talk. lol Good luck with the Double Wedding Ring. It will be fun to work on something like an antique quilt. Always a challenge, but well worth it. Have fun!